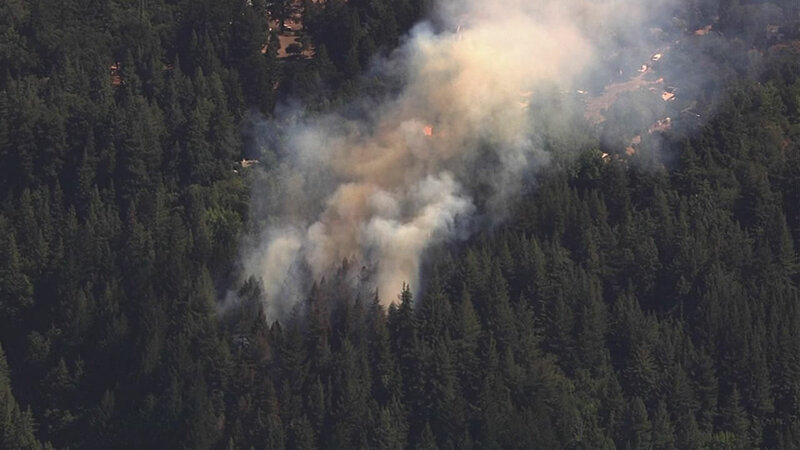 LOS GATOS, Calif. (KGO) -- Residents are being asked to evacuate their homes as a large number of firefighters work to control a blaze in the Santa Cruz Mountains Monday afternoon, according to fire officials. The brush fire started next to state Highway 17 in the unincorporated Santa Clara County community of Redwood Estates around 3 p.m., according to Santa Clara County Fire Department and Cal Fire. Cal Fire Division Chief Jim Crawford said around 200 firefighters are either on scene or en route to the blaze. Crews have brought the forward progress of the fire to a halt as of around 4:45 p.m. but have not extinguished it, Crawford said. Twenty structures are threatened by the vegetation fire. There have not yet been any reports of damage to homes or injuries. Residents in the area were asked to leave their homes and take shelter at a Redwood Estates Services Association pavilion, Crawford said. One southbound lane of Highway 17 is now open. Traffic is being diverted.